Maximize the storage capacity of your Dell PowerVault or Dell PowerEdge system. 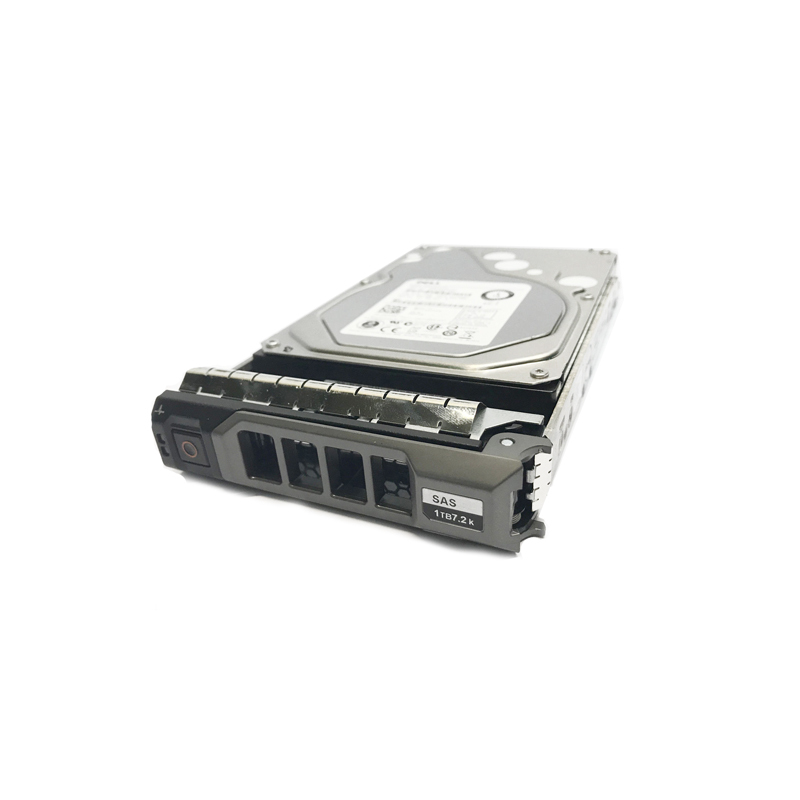 The FNW88 is a 1TB 7.2k RPM SAS 3.5″ hard drive with tray for use specifically in Dell PowerVault direct attached storage (DAS) arrays and Dell PowerEdge servers. Whether you’re upgrading your Dell PowerVault or PowerEdge system or simply looking for a replacement hard drive, we have what you need. The FNW88 1TB 7.2k NL-SAS drive is also known as part numbers 9ZM273-150, ST1000NM0023, and 0FNW88. If you don’t see the part listed that you’re looking for, please use our Contact Us form; as we have many parts in inventory that are not listed. Please note that all Dell hard drives, systems and parts are used, fully-tested, and backed by a 60 day warranty. Same day, expedited, and international shipping available! Enterprise SAS 3.5″ MTBF, like FNW88 / 0FNW88 at 1.4 million hours versus consumer 3.5″ SAS at 550K hours MTBF. Dell’s enterprise SAS solutions for PowerEdge servers and PowerVault enclosures, is a SAS interface for hard drives featuring specific design and manufacturing processes enabling 24x7x365 operations and 1.4 million hours MTBF within an enterprise environment. Enterprise SAS drives offer similar dollar-per-gigabyte advantages as consumer SAS for tier-2 storage while also providing key design and process enhancements to allow for successful integration with specific Dell RAID controllers as part of Dell’s server and storage solutions. While typical SAS drives commonly found in the consumer, desktop and notebook arena lack the design and reliability characteristics required for the more strenuous enterprise environment. These consumer (or client)-grade hard drives are typically rated at around 550K hours MTBF (mean time between failures) and not rated for 24x7x365 usage. While these consumer-grade drives are typically OK to utilize as boot devices, their capability to perform within the enterprise is limited. Enterprise SAS drives are rated for 24x7x365 operation, have Dell developed and certified firmware to ensure compatibility within Dell servers and storage, and also are typically equipped with rotational vibration circuitry to allow for the adjacencies of multiple drives, servers and storage enclosures common within the enterprise. Nearline SAS — Combines the head, media and rotational speed of traditional enterprise-class SAS drives with the fully capable SAS interface typical of 10K/15K rpm SAS drives. These drives are rated at 1.4 million hours MTBF. Enterprise SAS — True enterprise-class specifications, rated at 1.4 million hours MTBF, these drives provide the traditional SAS interface, but with capabilities far exceeding consumer grade SAS drives. Dell PowerVault PowerEdge Nearline SAS HDD with part numbers FNW88, 9ZM273-150 & ST1000NM0023 is best suited for higher-capacity environments to help realize cost and capacity benefits. Sequential access applications have a tendency to maximize any caching advantages of the storage system, and take advantage of the higher density SAS disk drives. In these applications, the speed at which the drive can transfer data from the platter has the greatest effect on overall performance. Thus, medium-to-large block and sequential I/O applications can reap the greatest benefits from the drive’s higher area-bit densities. Dell PowerEdge T-Series T20, T100, T105, T110 (Gen I,II), T300, T310, T320, T330, T410, T420, T430, T605, T610, T620, T630, T710 Servers, Dell PowerEdge R-Series R210 (Gen I, II), R220, R230, R300, R310, R320, R330, R410, R415, R420, R430, R510, R520, R530, R530XD, R630, R710, R715, R720, R720XD, R730XD, R730, R900, R905, R920, R930, Dell PowerEdge C-Series C1100, C2100, C6100, C6220 Servers, Dell PowerEdge M-Series M420, M510, M520, M610x, M630, M710HD, M830, M915 Blade Servers, Dell PowerVault M-Series M1000e, MD1120, MD1200, MD1220, MD3000i, MD3060e, MD3200, MD3200i, MD3220, MD3220i, MD3400, MD3420, MD3460, MD3600f, MD3600i, MD3620f, MD3800f, MD3800i, MD3820f, MD3820i, MD3860i Storage Arrays. Dell PowerVault N-Series NF600, NX300, NX400, NX3000, NX3100, NX3200, NX3300 Network Attached Storage.